Lets Flood the System This Fall! Over the past year, hundreds of thousands of people have flowed into the streets to fight back. Fast food workers in over a hundred cities went on strike, with thousands arrested demanding $15 an hour and a union. Young people in Ferguson, protesting the murder of Michael Brown by Darren Wilson, showed us the power of sustained action as they fought back against state violence for weeks, reinvigorating a national movement for Black liberation. Hundreds of thousands of climate activists marched at the People’s Climate March in New York, and the next day Flood Wall Street shut down the heart of New York’s financial district. Across the country, and the world, powerful movements are using nonviolent direct action to to disrupt business as usual and demand lasting systemic change. These moments show that broad mobilization and disruption are ways that we can transform our society. It is time we move beyond conventional strategies. 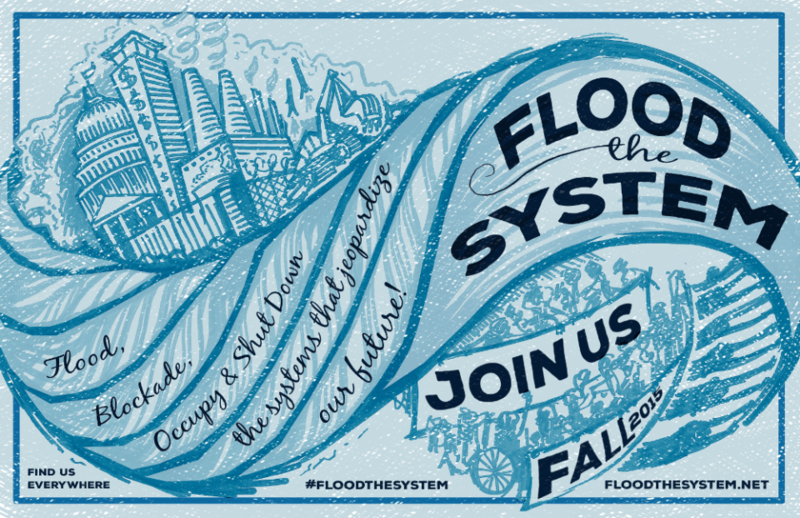 Its time we connect across movements and #FloodTheSystem. LETS BRING THE FLOOD TO THE ROCKIES THIS FALL — AND MOVE MONTANA AWAY FROM A FUTURE AS AN ENERGY EXPORT COLONY. WE ARE WORKING WITH INDIVIDUALS AND ORGANIZATIONS ACROSS THE REGION TO HELP AMPLIFY THE STRUGGLE FOR SOCIAL, ECONOMIC AND ENVIRONMENTAL JUSTICE. PLEASE STAY TUNED HERE, ON THE FLOOD THE SYSTEM WEBSITE or on the BLUE SKIES CAMPAIGN WEBSITE. WE HOPE TO SEE YOU IN THE STREETS, THE FIELDS, FACTORIES, FAST FOOD JOINTS, DETENTION CENTERS AND MINE SITES THIS FALL!